MDF is indispensable material for any budget repair, if you want to make a partition, to level the surface, to provide sound insulation, etc. the Only disadvantage of the material is hydrophobic. This limits the range of applications or requires additional processing to eliminate the distortion and to increase lifespan. In the home the user is often faced with the necessity of pasting the sheet of fiberboard or paper Wallpaper. Here the question arises, how to behave fibreboard in direct contact with the water-based adhesive. To prevent deformation, it is recommended to impregnate the surface with any (your choice) water-resistant remedy. The role of primer suitable heated to 50 ° C the oil is repeatedly applied a thin layer after thorough drying of each previous layer. You can use any other repellents. For example, pinoteks - well-proven and modern tool to protect wood materials. It is for outdoor and indoor use. Special attention when the treatment should be given region of the ends of the plate. After the primer has dried, it is recommended to cover the surface with a thin layer of filler if needed to smooth out the joints. Well give it to dry. And then re-apply the primer to reduce the subsequent consumption of glue. If the plate is solid, you can do the same with primer. Proceed to the pasting of Wallpaper is possible only after ascertaining that the surface is completely dry. Prepare the glue in advance. It is better to choose it among the mixtures, enriched with antifungal additives. Then follow well-known rules. Start to glue the Wallpaper taken from Windows, before it was due to pasting Wallpaper overlap. Now this problem has disappeared, so it's better first sheet to the first position from the corner (if its direct properties no doubt) or doors. Using a level or plumb line mark the wall, evenly coat them with glue over the entire surface. Exactly attach the first sheet of Wallpaper, avoiding distortions. Remove from the cloth any excess glue with a special roller or soft spatula, rubbing motion from the center to the edges. Edge RUB with a clean dry cloth. The following sheet carefully glued back to back. Reaching the corner, carefully RUB it. Here the Wallpaper glued overlap (5-6 cm) or means of connecting, if the cloth pretty tight. The excess is carefully removed with a razor blade. Papered the room should dry 1-2 days. You can then begin to paint water-based varnish or special paints. Paneling is often made with chipboard – chipboard, ensuring the alignment and an additional warming of the surface. Before you paste over chipboard Wallpaper, the surface requires special training. Usually chipboard is applied at a covering of walls in premises with dry air. Before gluing wall-paper, chipboard should be thoroughly dried, to release all the moisture. In the summer it is enough to open the Windows. In the cold season outside of the plate must be wiped with a damp cloth, and after a few hours to install the room heater. Remnants of old Wallpaper is a serious enemy to the durability of the coating of a new layer. Therefore, before priming the particle Board should be thoroughly cleaned from episodes the same coverage. Pieces of paper Wallpaper is easily removable when wet, in turn, non-woven and textile coating are removed with a spatula. Further preparatory work depends on which side of the sheet of chipboard attached to the wall. If the rough side of the sheet facing the wall, then smooth the surface is thoroughly primed and the seams smeared with plaster on wood. After drying, the wall is cleaned with fine emery paper. However, this may not be enough, and for improved grip a smooth wall surface with Wallpaper chipboard must be covered with layer of gauze. To do this the entire length of the sheet with nails nailed strips of gauze, primed and stained with oil paint neutral tint. If the sheet of chipboard attached to the wall with its glossy finish inside, its simply primed and putty. So over time, the Wallpaper is not showed traces of rusty nails, which chipboard is attached to the wall, it should score hats and cover them over primer oil paint. After complete drying out of putty you need to check whether one layer of putty to fully smooth the joints. If the gaps between the slabs are laid too far apart, the space can be filled with strips of gauze and carefully putty. When choosing Wallpaper for CPD should prefer vinyl and non-woven options. 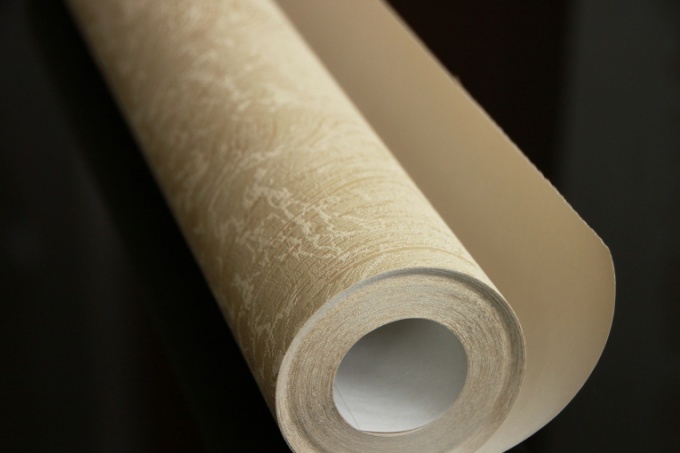 Without the skills of an experienced repairman difficult to glue paper Wallpaper on chipboard, because they require precise application of the strips and do not allow to adjust already attached sheets. In turn, more expensive products simplifies installation at the joints. It is also important that non-woven, vinyl and textile wall longer than the cheap counterparts will keep the shape, and due to the more dense and durable coating hides irregularities remaining after priming. To hang Wallpaper you need from the corner towards the door. To overlay the first strip as evenly as possible, is applied to the wall straight vertical line with a plumb. If the Wallpaper does not require adjustment, the strip can be cut in advance, leaving the stock to a 10 cm top and bottom. The picture that must be customized, will require sustained crop marks, also providing for the allowances. The technique of applying the adhesive also depends on the type of Wallpaper. Paper Wallpapers require the application of the layer on the reverse surface of the strip and the wall. Vinyl and the interlining is attached to the adhesive layer applied directly to the wall.